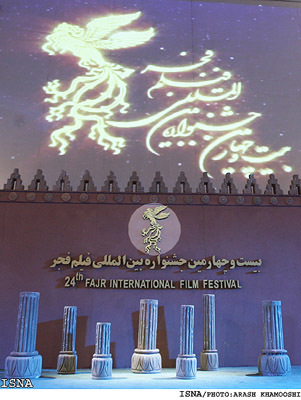 TEHRAN, Jan. 17 (Mehr News Agency) -- The 24th Fajr International Film Festival kicked off at the Interior Ministry Hall of Tehran on January 19, which is the occasion of Id al-Ghadir. 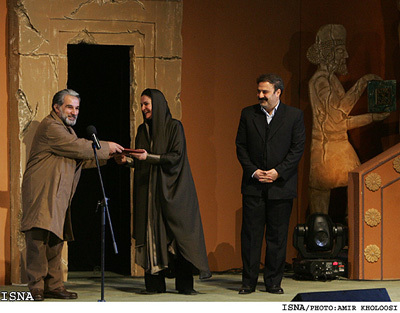 Iranian actress Golab Adineh, filmmaker Khosro Sinaii, and composer Majid Entezami were honored during the opening ceremony. 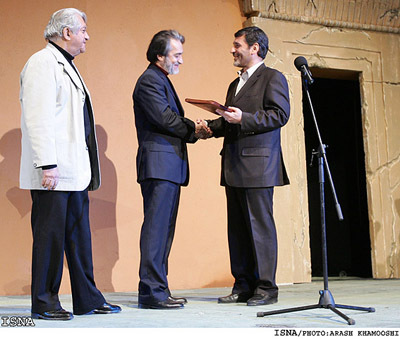 The opening ceremony was directed by Manuchehr Mohammadi, and Bijan Mir-Baqeri; Mehdi Karampur, and Hamid Farrokhnejad had prepared the visual programs of the event. A total of 24 films will be contending for the Crystal Simorgh, the most prestigious Iranian cinematic award, in the category of Iranian Films. 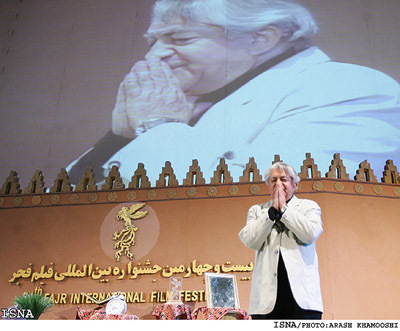 The 24 films are "A Faraway Place" (directed by Khosro Massumi), "It Is Winter" (Rafi Pitz), "Stars, Volume One" (Fereidun Jeirani), "Crossroad" (Abolhassan Davudi), "Ferdows Park, 5 P.M." (Siamak Shaqayeqi), "When Everyone was Asleep" (Fereidun Hassanpur), "Men at Work" (Mani Haqiqi), "Persian Prince" (Mohammad Nurizad), "Slowly" (Maziar Miri), "In the Name of Father" (Ebrahim Hatamikia), "Havana Case" (Alireza Raiisian), "Chahrshanbeh-Suri" (Asghar Farhadi), "Journey to Hidalo" (Mojtaba Raei), "Distracted" (Mohammad-Ali Sajjadi), "Cafe Setareh" (Saman Moqaddam), "Devilish Acts" (Yadollah Samadi), "Goodnight Commander" (Ensieh Shah-Hosseini), "Rival Wife" (Alireza Davudnejad), "How Much Do You Want to Cry" (Shahed Ahmadlu), "Red Chest" (Parviz Sheikhtadi), "Friday Evening" (Mona Zandi Haqiqi), "Online Murder" (Masud Abparvar), "Time Stands Still" (Alireza Amini), and "Zagros" (Mohammad-Ali Najafi). 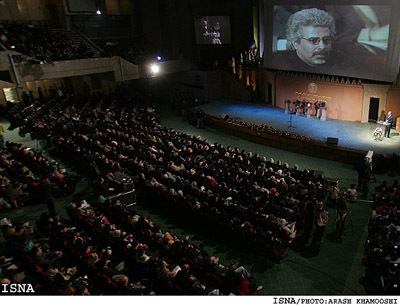 The organizers have allocated 14 Tehran movie theaters for Iran's most important film gala, which will be held in the capital from January 20 to 30. 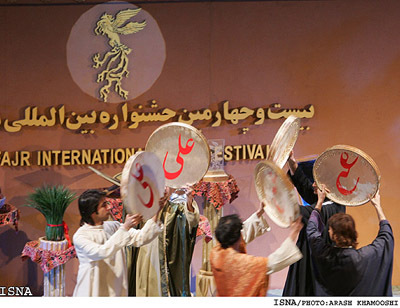 The normal time for the festival, the beginning of February, coincided with the holy month of Muharram this year, thus the 2006 edition will be held ten days earlier. "Cache" (directed by Michael Haneke, 2005, from Austria, Germany, Italy, and France), "Broken Flowers" (Jim Jarmusch, 2005, from the United States), "Good Night, and Good Luck" (George Clooney, 2005, from the United States), "Oliver Twist" (Roman Polanski, 2005, from England), "Keys House" (Gianni Amelio, 2004, from Italy), "Merry Christmas" (Christian Carion, 2005, from France), and "Le Couperet" (Costa-Gavras, 2005, from Belgium, France, and Spain) are some of the films that will be screened in the competitive and noncompetitive categories of the International Section of the festival. This year's festival will also be holding retrospectives of Japanese filmmaker Yoji Yamada and American director Sydney Lumet. Directors Kianush Ayyari and Azizollah Hamidnejad and critic Mahmud Gabarlu will be the jury members of the festival's first and second films sections. Director Mohammadreza Aslani, filmmaker Nader Talebzadeh, and screenwriter Alireza Sajjadpur will judge the 40 Iranian documentaries to be shown in the Reality Eye (documentary) section of the event. 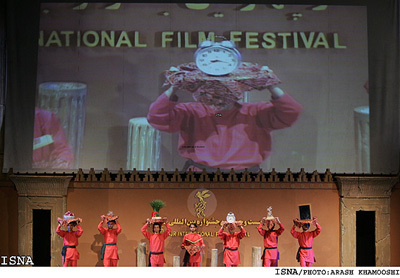 In addition, seventy-two companies from 42 countries will offer their latest productions at the Ninth Iranian International Film Market, beginning in Tehran on January 24. Companies from Canada, France, Germany, Italy, Lebanon, Malaysia, Syria, Turkey, Britain, Russia, Indonesia, Qatar, the United States, Denmark, Taiwan, the Netherlands, and several other countries will be participating in the market.